Recent events regarding the contamination of infant milk with a strain of Salmonella in France, lead us to ask ourselves the question of the use of such bacteria for malicious purposes in the field of BCRNe for example. On 1 December 2017 an outbreak of Salmonella Agona in children was identified. By 11 January 2018, 37 cases (median age of 4 months) and 2 later cases outside France were confirmed. Five different infant milk products manufactured in the same factory were held responsible. After several successive recalls, all products manufactured since February 2017 were withdrawn from the market on December 22. It should be noted that the same plant was contaminated by the same bacterial strain in 2005. Our aim here is not to highlight hesitations and other failures, particularly in the case of the distributors in implementing withdrawal guidelines, but to talk about Salmonella and its possible involvement in malicious uses. Children showed gastrointestinal symptoms: diarrhoea (including some bloody), fever and vomiting. There was no sepsis or meningitis. Eighteen children were hospitalized, no children died. They belong to the family of Enterobacteriaceae. The genus “Salmonella” includes several species of which the species “enterica” is the most frequent. The bacteria of the subspecies “enterica” include the essential bacteria infecting humans. A reaction involving antisera is used to distinguish between the different Salmonella: this differentiates between “serotypes”. This recent outbreak was due to Salmonella enterica, subsp. enterica, serotype Agona or more simply Salmonella Agona = S. Agona. There are 2 types of pathogenicity in Salmonella. The so-called “major” salmonella: S. Typhi, S. parathyphi A, B and C. These are strictly human bacteria and they are responsible for typhoid and paratyphoid fevers, which are serious and even fatal diseases. Worldwide, an estimated 20 million cases and more than 200,000 deaths a year are estimated. Bacteria enter the bloodstream. Contamination is mainly caused by stool-contaminated water. Cases will, therefore be grouped mainly in developing countries where the supply networks are unreliable. It should be noted that the typhoid vaccine is no longer marketed in France. The cured patient can retain salmonella for a very long time, especially in the bile ducts, and become what is called a “healthy carrier”, spreading the contaminating germ around him. The so-called “minor” salmonella responsible for foodborne infections or “salmonellosis”. Present naturally in the digestive tract of farm animals (cattle, sheep, poultry…) they spread through their faeces. They can live in the water for several months. Excreta can contaminate milk at the time of milking or eggs during egg laying. If the shell is cracked or if the egg has been washed (in this case, the protective barrier covering the pores of the shell is removed) the bacteria can penetrate inside. Symptoms are those of acute gastroenteritis. After a short incubation of a few hours to a day, the germ multiplies in the intestinal lumen causing an inflammatory intestinal syndrome with diarrhoea often mucopurulent and bloody. Dehydration in infants can lead to severe toxicosis and as a result, the recent outbreak that has spread to infants has been very worrying, with children being hospitalized. In healthy adults, the disease is generally mild. In immunocompromised patients, the bacteria can pass into the bloodstream and give a much more serious disease. This disease is common with 10,000 cases of Salmonellosis in France and per year reported, but as not everyone consults for gastroenteritis, there are almost 200,000 estimated infections caused by these minor salmonella. In Western Europe, the most common serotype is S. Thyphimurium (70%). Salmonella is therefore transmitted through stools that contain it and therefore contaminated hands. This explains why the stools of the Lactalis plant personnel have been tested in order to determine the possible presence of this bacteria, the origin of the contamination is still not explained. S. Typhi is classified in group 3 of pathogenic bacteria, S. paratyphi are in group 2 as well as all other serotypes. The periods of war have been favourable to the spread of the disease. This was the case for the Napoleonic Wars, the Civil War and the Boer War in which the British army lost more than 8,000 soldiers because of the disease, that is to say more than the number of people killed by the acts of war. During the First World War, 125,000 cases were recorded in the French army, including 15,000 deaths. During the Second World War, 58,000 cases were declared among the civilian population with a lethality of up to 25% depending on the region. 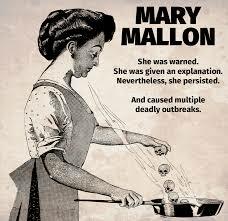 Mary Mallon also called “Mary typhoid” is the first known case of a healthy carrier of the typhoid bacillus. Of Irish origin she emigrated to the United States in 1884. Employed as a cook in the New York area, 2 weeks after her arrival, her employers contracted typhoid. She moved and at her new employers, a laundry woman died of typhoid fever. Recruited by a lawyer, 7 of the 8 family members contracted the disease. In all his successive employers the cases of typhoid were repeated. Identified as a healthy carrier, she was put into isolation, in quarantine, in a clinic for 3 years: obviously, she does not understand what was happening to her and did’nt want to give up her job as a cook. In 1910 she was released on condition that she followed strict hygiene measures and was no longer working as a cook. She then changed her name to work illegally in the kitchen and, in total, at least 32 people have been infected, two of whom died. In addition, we know that she had contaminated fellow cooks who may have transmitted the disease themselves. She was quarantined in 1915 and remained there until the end of her life when she ended up as a laboratory technician. Her autopsy will show the presence of S. Typhi in his gallbladder. 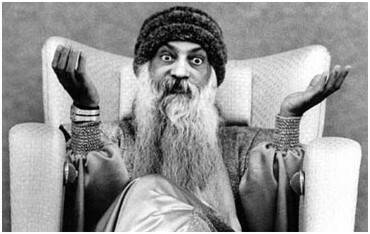 Bhagwan Shree Shree Rahneesh (1931-1990) (see cover photo) had created a sect: the Rajneesh Foundation International. In 1981 she moved to a ranch near the small town of The Dalles in Oregon. With 4,000 supporters, it plans to extend its activities throughout the county during the 1984 local elections. To prevent the population from voting, she plans to make voters sick by contaminating salads and other raw vegetables in The Dalles 10 restaurants with a strain of Salmonella Typhimurium (they even plan to contaminate the water distribution system on election day). Finally, 700 people were infected and the epidemiological study clearly demonstrated the Rajneeshees’ responsibility for this first bioterrorist attack on American soil. In 1985, Rajneesh was expelled and after being refused in 21 countries he returned to Poona (Pune, India) where his sect grew again to reach 15,000 members! 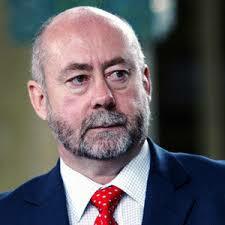 We have to note that in 1981, the South African government of Pieter Willem Botha undertook an offensive chemical and biological weapons development programme known as Project Cost, developed by Wouter Bason (cardiologist, Air Force officer), during which bacterial cultures were produced in large quantities, including Salmonella. Salmonella are bacteria, some of which have an important pathogenicity (Typhoid, paratyphoid) and others that cause gastroenteritis. These bacteria have been used in terrorist actions and militarization trials have apparently been carried out without much success. They are classified as Category B, which includes micro-organisms that are more difficult to disseminate, which determine less serious diseases than Category A, with lower mortality or more complex growing conditions but which require specific surveillance and diagnostic capacity. Ongoing nationwide outbreak of Salmonella Agona associated with internationally distributed infant milk products, Fran, December 2017, Nathalie Jourdan-da Silva et al. Euro Surveill. 2018;23(2):pii=17-OO852. https://doi.org/10.2807/1560-7917.ES.2018.23.2.17-00852. This entry was posted in blog-en and tagged biological agent, History, Medical. Bookmark the permalink. How did Reinhard Heydrich die? An event related to BCRNe ?